It is probably the most addicting time on any farm. It drives farmers, farm kids, and prodigal farm kids (of which I am one) to long hours in a field trying to get the crops out as fast as you can. Once they are ready, it is a push to the end. This year, though, it was a different beast as the dry summer brought harvest a month earlier than hoped, but it also meant that things needed to get done as quickly as possible or else the crop would be too dry to really be worth much of anything. So, off to the fields we went. Corn went first and went fast. It was dry and to keep the yields as high as possible, that is where the energy was focused. Yes, those are soybeans in the field … I know. I missed the weekend for a vacation with the family. That’s what happens when things happen a month earlier than expected. However, with the newer equipment that my dad and brother have been accumulating, things went very smoothly. 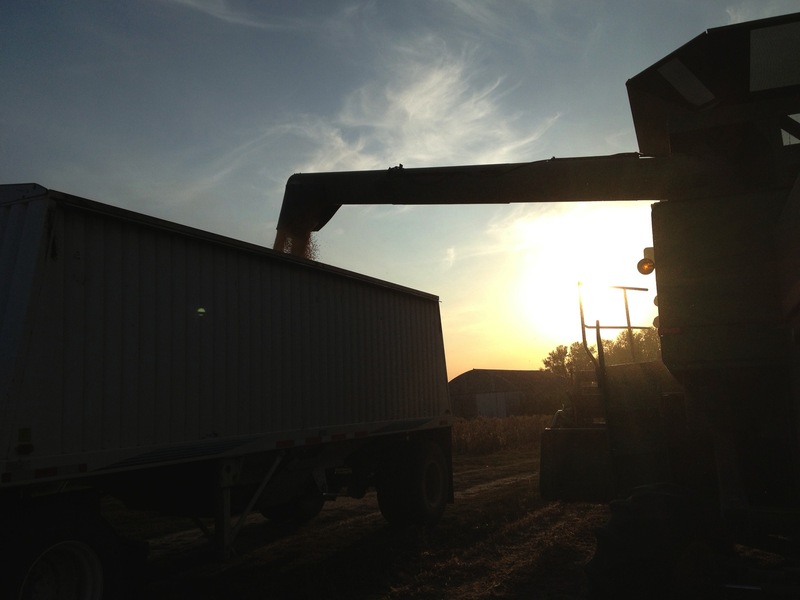 A combine, a semi, a tractor, and a grain cart makes sure things move quickly and smoothly through a cornfield. At one point we were able to fill the semi, dump the semi, and then have another grain cary and combine hopper ready by the time the semi was back. That’s efficiency. Switching to beans slows things down considerably. 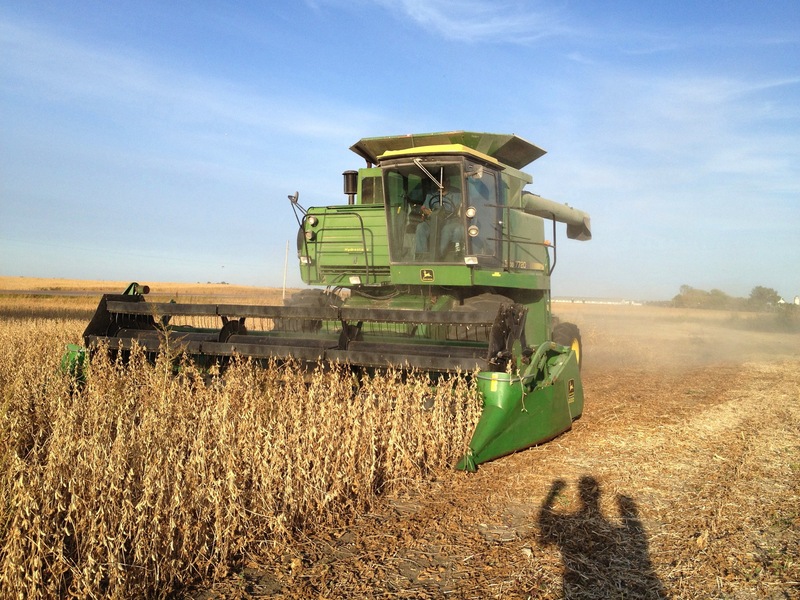 Going from 200 bushels/acre of corn to 50 bushels/acre of beans means that you really don’t need to steady work of an additional tractor + grain cart which frees up time for other work to be done in preparation for winter. My brother started work on tillage by chopping the corn stalks in the corn fields and preparing the new ripper as well. 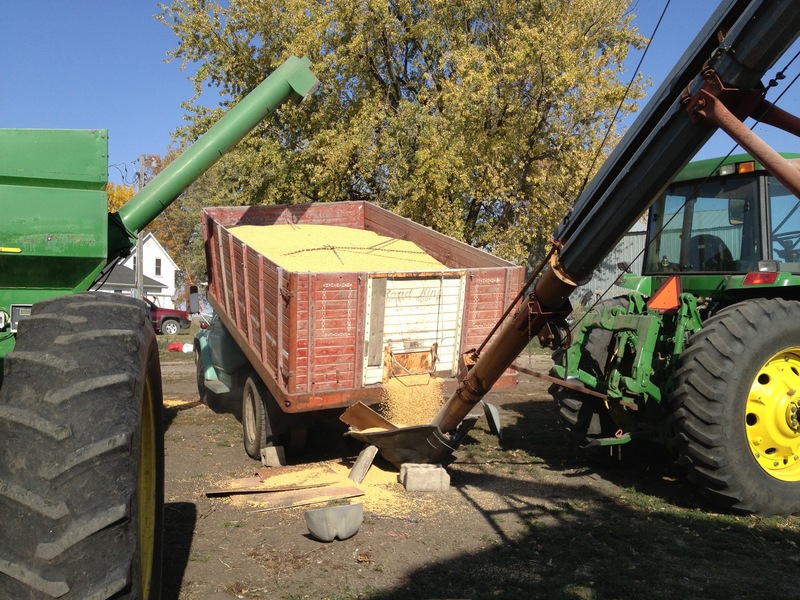 However, there is still stuff to do with the beans and the final act is to try and fill the grain bin. That is when the semi is “semi retired” for the year (that was terrible) and the grain cart gets used to ferry the crop for the field to the make-shift system at the bin to get the soybeans into their metallic home. And that is that. All of the crop it out of the field. Tillage is now the name of the game and hog manure will soon be going into the soybean fields as preparation begins not just for winter, but for the coming year and growing season. Not to mention that work continues on trying to get an expansion for the hog operation started for next spring. We are currently working through the logistics of the permitting process to add capacity to the current farm site and maybe another site as well. Trying to navigate the crazy regulations that are part of agribusiness today is sometimes mind-boggingly frustrating, but it is what it is … as they say. I’ll hopefully have more to say about that in the future. Harvest is one of my favorite times of the year. It was something I never really gave much thought to growing up, but it is something that I cherish more each year as my wife and I get more involved and I watch how much my sons love to be out on the farm during that time of year, or really during any time of year. Being that close to the actual ground of the world is fascinating experience. Pulling the crops out of the field and seeing how much you have completed is a very satisfying experience and unlike the work I do during the rest of my day. Visually seeing progress is exhilarating. Knowing there is an end is comforting. These are things I now look back and wish I would have known growing up. Would I have become a farmer straight away? No, I don’t think so. However, I would have probably appreciated the opportunities that I did have growing up like I do now. So, another harvest is in the bag and we look forward to the work to come.